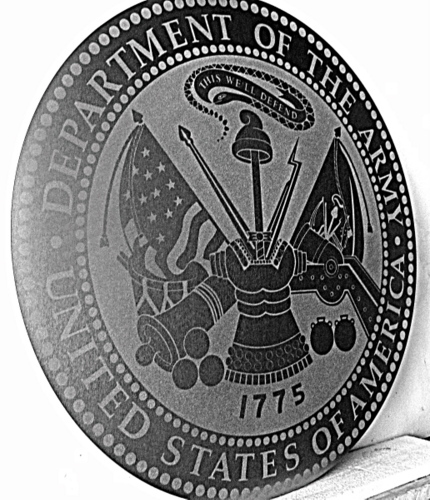 Shown above is a solid brushed aluminum US Army Great Seal, which has been sandblasted in some areas to produce contrast for features of the image. This plaque is basically 2-D; there is very little relief between the smooth areas and the sandblasted areas. To see prices or get Estimate and Order forms , click on gray boxes in upper left margin. Click on dark gray tabs on the header to see Home and other informational pages. Click on one of the light gray numbered boxes in the lower left margin to see other photo galleries. Other military plaques are shown in Gallery 31.